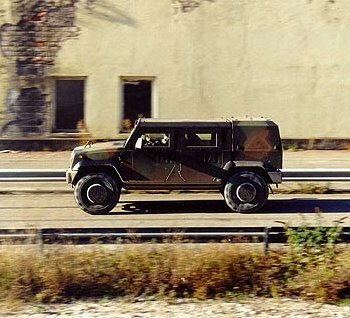 Fiat are actively considering building a 'civilian' version of the armed forces-targeted Iveco MLV (Multi Light Vehicle), which would take head-on the huge US military-derived Hummer squarely, in what is becoming a fast-growing segment. A showcar - which clothes the MLV's floorpan, engine and mechanicals in much more 'civilian-use' bodywork - is likely to be presented as early as the Bologna International Motor Show in early December. Fiat will judge public and press reaction before considering the project any further. 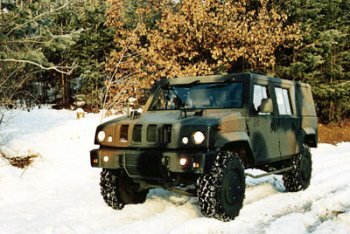 Since being established in 1975 through several mergers, Iveco has become the first, proper pan-European commercial vehicle manufacturer, and through it’s 'Defence Vehicles Division' it is now a world leader in the design, production and support of both armoured and soft skinned military vehicles, which are today supplied to a wide variety of nations' armed forces. 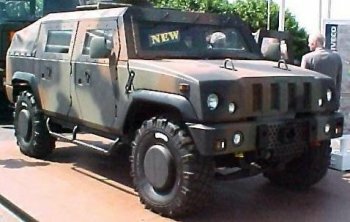 The most recent addition to Iveco's armoured vehicle range is the new Multirole Light Vehicle (MLV), built to exploit the success of the US-built Hummer, and provide NATO requirements for an alternative vehicle. This will form the basis of the Bologna-bound showcar. The MLV is all-new four wheel drive vehicle which has been specifically developed for the changing operational requirements of the twenty first century. This new tactical vehicle combines speed and protection with stealth and tactical versatility. The MLV is light weight, well-armoured against small arms fire, shell fragments, and mines, and is readily air transportable, all of which are key characteristics required in meeting the increasing need for rapid deployment of troops and equipment. With a length just under 5000mm and weighing 6500kg, the Iveco MLV is readily air-transportable in either EH101 and CH47 'Chinook' (2 vehicles) helicopters, or the C-130 'Hercules' (2 vehicles) 4-engined transport plane, thus ensuring that it can be rapidly deployed into any operational theatre. It's engine, which complies with Euro 3 regulations, is an Iveco F1 D with 185bhp. The MLV has automatic transmission, hydrosteering, off-road ABS, a central tyre inflation system, independent suspension and, following brief preparation, can ford depths of up to 1.5m. All of these attributes combine to give MLV exceptional versatility and mobility in all terrain. Armoured protection kits include underbelly mine protection, additional anti-tank mine protection under wheel arches, 360o protection against 7.62mm AP attack and protection against 155mm fragments. 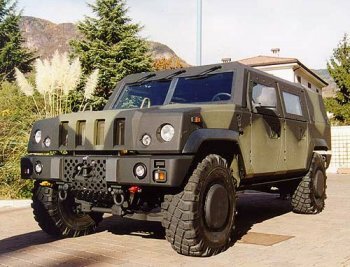 Several hundred of the new Iveco MLVs have thus far been ordered by the Italian army, in both armoured and unarmoured formats, while the British Ministry of Defense has recently chosen it to fulfill their on-going requirements for a "Future Command and Liason Vehicle" (FCLV), a purchase decision which will swell the order book considerably. 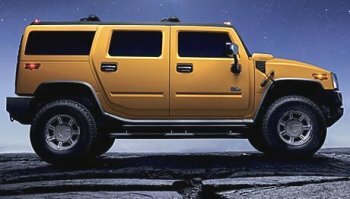 The US-built Hummer shot to prominence during the 1991 Gulf War and in the intervening decade and a half the civilian-use versions have achieved widespread popularity with car buyers in America, and it has become a global car brand in its own right. The original H1 was quickly joined by the more refined H2, while this year a 'baby' version, the H3, was spawned, thus expanding the model range to three vehicles. Bought mostly by customers who perceive it to be a 'must have' fashion accessory, the crudely-built Hummer commands a high profit margin, and Fiat now wish to explore the potential of this unique market niche, which is has quickly spread from the US to Europe, where large off-road capable vehicles are already a popular choice. It has now being suggested that Fiat will present a showcar closely based on the Iveco MLV as soon as the Bologna Motor Show next month.